The original 1914 identifying tablet at platform level. 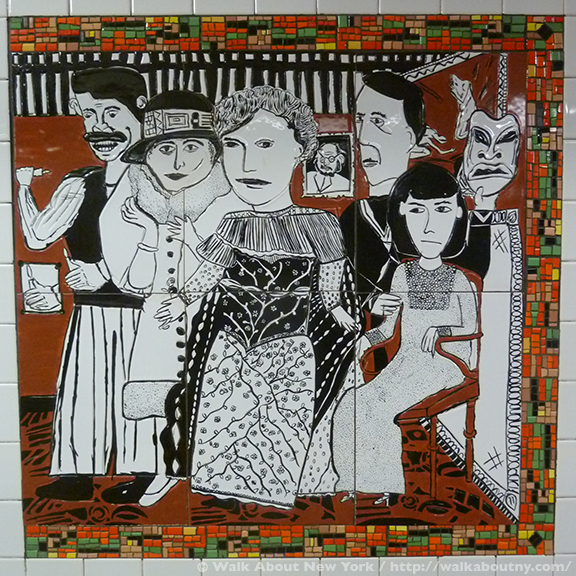 Today we spotlight three of our favorite parts of New York: One, Greenwich Village, our home for 39+ years, and which is celebrating the 50th anniversary of its designation as New York City’s largest landmarked Historic District; Two, Subway Art, this one at the Christopher Street/Sheridan Square stop in the Village; and Three, the Stonewall Uprising, which launched the modern gay rights movement 50 years ago. 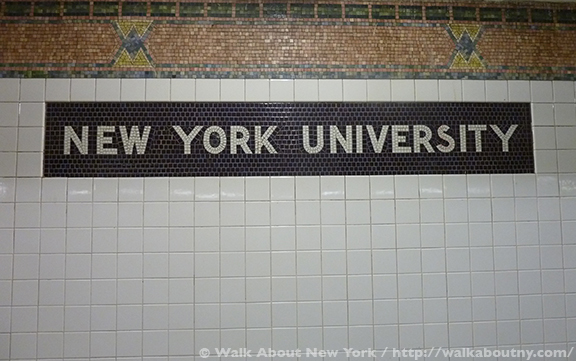 NYU can be reached from the Christopher Street stop. 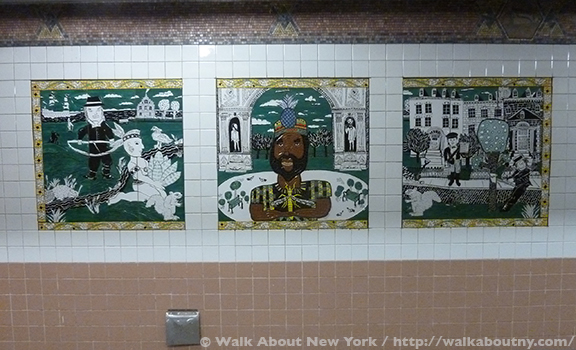 The permanent art installation at the Christopher Street/Sheridan Square stop is made up of four themed murals; each mural is divided into three panels. 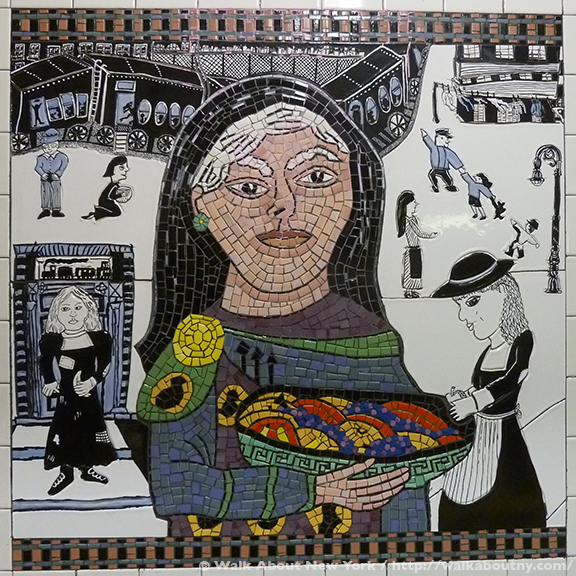 The artist Lee Brozgol, worked with nine students from the Village’s premiere elementary school, the Greenwich Village School on West 11th Street. The students were selected from the fifth and six grades by Deborah Lewis, an art teacher. 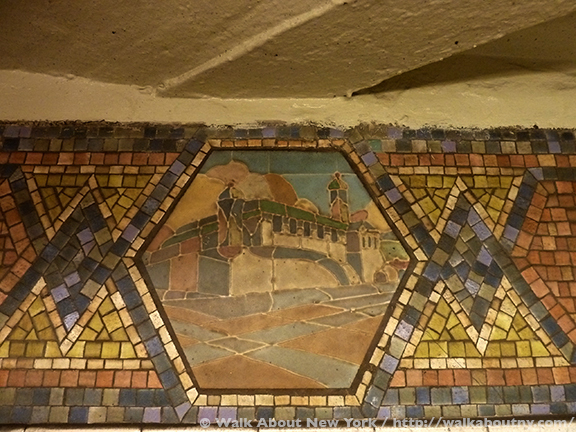 The original 1914 platform identifying art at Christopher Street subway stop is the 18th century Newgate Prison in the Village. 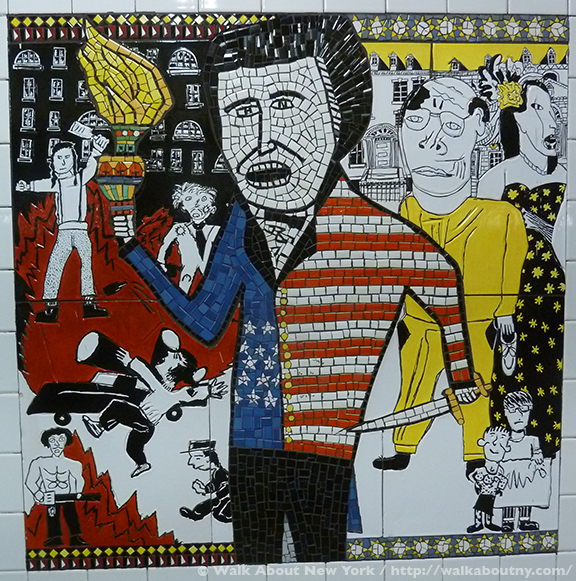 The title The Greenwich Village Murals may strike some as simple but it does get to the heart of the matter. 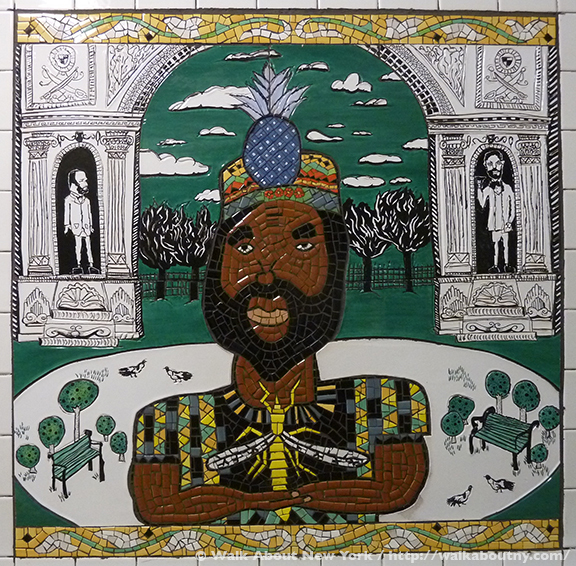 These 1994 murals mash together historic figures, events, locations, and sights across the centuries and from around the Village to create dynamic images in ceramic mosaic. 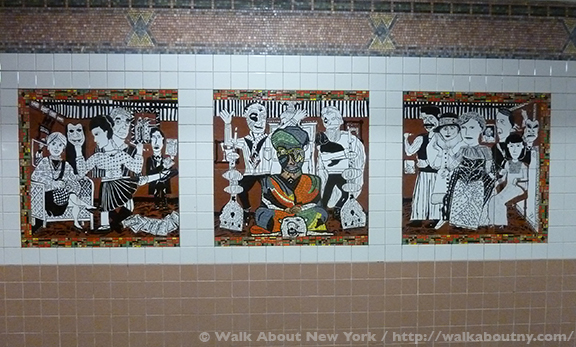 There are two murals on the uptown platform and two on the downtown one; each mural is titled and divided into three panels. 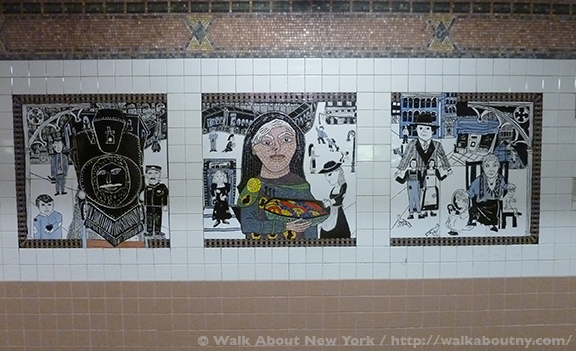 This mural highlights Greenwich Village’s centuries-long welcoming spirit to society’s outsiders. The men and women depicted, through their words and deeds, have helped advance social justice not only in New York but throughout the United States and the world. 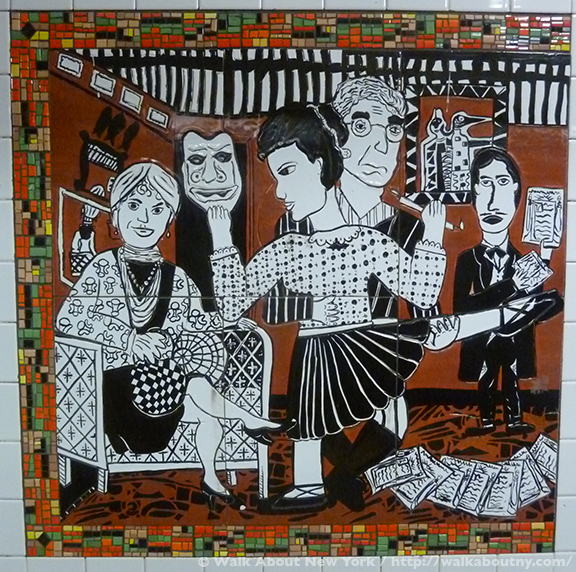 The left-hand panel: Seen a bit off centered is plaid-shirt-wearing Emma Goldman (1869–1940), a political activist and writer. Labeled by the FBI “one of the most dangerous women in the country” because Ms. Goldman, a Jewish immigrant, advocated controversial stances on free speech, birth control, labor unions, and women’s rights. While living at 208 East 13th Street from 1903 to 1913 she published her magazine Mother Earth there. To the right stands Henrietta Rodman (1877–1923). A native of what would become one of New York City’s five boroughs, Queens, she graduated from Columbia’s Teachers College in 1904. Miss Rodman became an English teacher and counselor at NYC’s first public high school for girls, Wedleigh High. Because of her work there she lobbied for women teachers’ right to maternity leave and professional promotion. She lived with her husband at 42 Bank Street in the Village. The center panel: The red-white-and-blue figure is Thomas Paine (1737–1809). Known as “the father of the American Revolution” Mr. Paine wrote a series of pamphlets, The American Crisis and Common Sense among them, that inspired the colonists to rebel. Following the Revolution he went to France, where he stirred up the revolutionary spirit with another pamphlet, The Age of Reason. He was imprisoned for it; his health was adversely affected. Upon his return to America he lived at two addresses in the Village, 309 Bleecker Street and 59 Grove Street, where he died. To the right are Barney Josephson (1902–1988), owner of Café Society, and Billie Holiday (1915–1959), the jazz singer, who was the opening night act there. Located at One Sheridan Square, Café Society was the first racially integrated cabaret in NYC. Miss Holiday premiered the song Strange Fruit, which dealt with the horror of lynchings of black men in the South, gaining publicity in the North. 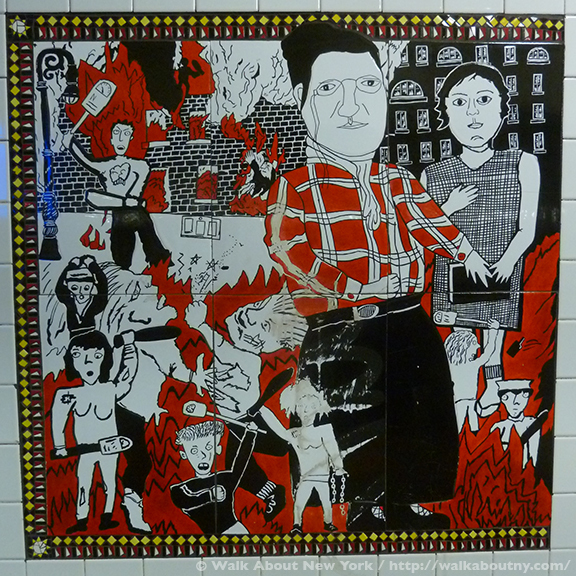 In the background of panels one and two are scenes of the Stonewall Uprising at the Stonewall Inn, a gay bar on Christopher Street. This protest was the beginning of the modern gay rights movement. The right-hand panel: Seated in the middle is journalist John Reed (1887–1920). The Harvard graduate wrote his first-hand account of the Russian Revolution, Ten Days That Shook the World at One Patchin Place, a short alley in the Village. Son of a wealthy Portland, OR family his first Village home was 42 Washington Square. Mr. Reed became an ardent socialist, visiting Russia in 1917 and again 1920, when he developed typhus and died. He is one of only three Americans entombed in Moscow’s Kremlin Wall Necropolis. The background scene to this panel is NYC’s joyful annual Gay Pride March, which ends in the Village. It was the logical and celebratory outgrowth of the Stonewall Uprising. You are invited to join the Wednesday evening salon of Mabel Dodge by this mural. The Bohemians focuses on the writers, producers, artists, actors and actresses, playwrights, poets, and patrons who lived and worked in the Village of the early 20th century. The left-hand panel: Seated on the left is Margaret Anderson (1886–1973), founder and editor of the avant-garde literary journal, The Little Review (1914-1929). She and her lover/assistant Jane Heap (1883–1964) shared a top-floor apartment at 27 West Eighth Street. Following their magazine’s serialization of James Joyce’s Ulysses, viewed as obscene, they were prosecuted and fined $50 each. The dancing couple is poet Edna St. Vincent Millay (1892–1950)and artist John French Sloan (1871–1951). Miss Millay holds a Greek mask of comedy, acknowledging her co-founding the Cherry Lane Theater, around the corner from her Village home at 75-1/2 Bedford Street. The bespeckled Mr. Sloan, who lived with his wife on Perry Street and established his studio at the Varitype Building, Sixth Avenue and Cornelia Street, was a leading figure in the Ashcan Movement, which depicted everyday life in New York, and in Mr. Sloan’s case mostly in the Village. The man on the far right, holding sheets of paper, is Floyd Dell (1887–1969). Mr. Dell moved to Greenwich Village in 1913, where he swiftly became a leader in literary social circles. 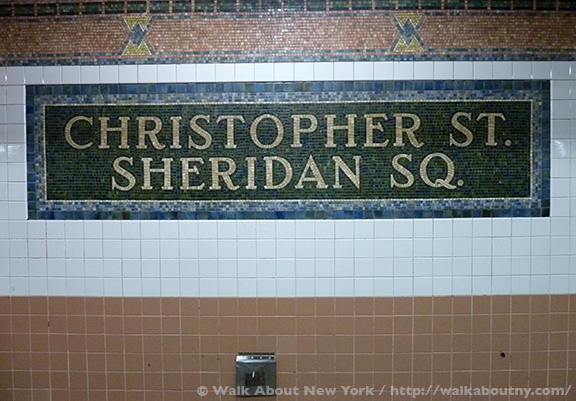 He lived at 11 Christopher Street and became managing editor at The Masses, a radical magazine. He would go on to publish 11 novels, books of poetry, biography and non-fiction. Mr. Dell and Miss Millay were briefly a hot item. 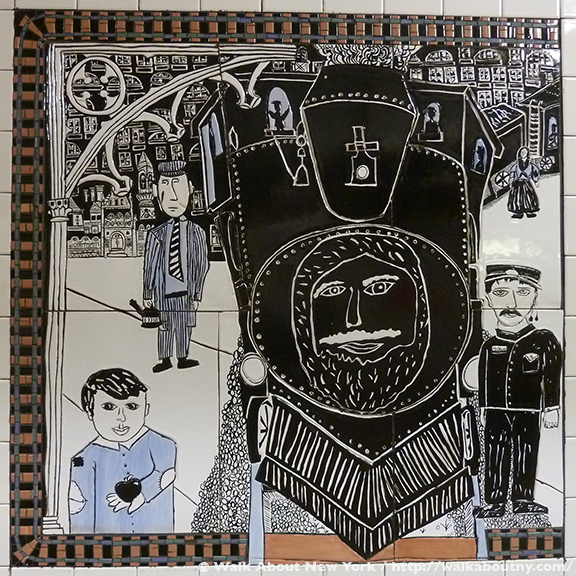 The center panel: Waving his arms about on the left is Max Eastman (1883–1969). Mr. Eastman wrote on literature, philosophy and society; he was a poet, and a prominent political activist. Moving to the Village he became editor of The Masses, located at 91 Greenwich Avenue, giving him an ideal platform for involvement with liberal and radical circles. The colorful turbaned woman, sitting cross-legged on the floor, is Mabel Dodge (1879–1962). Mrs. Dodge arrived in the Village after years of sumptuous living in a Florentine villa. The four-times married Buffalo heiress’s 1914 salons provided material and spiritual nourishment for the restless and needy souls of the Village. Held in her luxurious apartment at 23 Fifth Avenue, Mrs. Dodge’s “evenings,” as she called them, were a gathering place for celebratory discussions of all things political, literary and painterly, as well as late-night trysts. Holding the black dog is George Cook (1873–1924). A theatre producer, director, playwright, novelist, poet, and university professor, Mr. Cook believed in his personal mission to inspire others. He was the driving force behind the founding of the Provincetown Players on Cape Cod, which would set-up a permanent home on MacDougal Street, just south of the Village’s Washington Square. The right-hand panel: Sporting a heavy black moustache is Hippolyte Havel (1871–1950). This Czech anarchist and writer came to Greenwich Village, which he declared to be “a spiritual zone of mind,” with his close friend Emma Goldman. Mr. Havel served as a cook and a waiter at a restaurant on the Village’s Washington Square. The restaurant attracted bohemians for its cheap meals and radical clientele and was known for snarling “bourgeois pigs!” at customers. The woman wearing a stylish cloche hat is not a woman at all; butMarcel Duchamp (1887–1968)as his alter ego, Rrose Sélavy. Mr. Duchamp, father of conceptional art with his urinal and bicycle wheel, was one of what the popular press dubbed the Arch Conspirators. This group of six Village bohemians climbed to the top of the Washington Square Arch in the wee hours of January 23, 1917; they spent the night, declaring Greenwich Village a free and independent republic. From 1942 to 1968 Mr. Duchamp kept a studio at 210 West 14th Street in the Village. The central figure is Ada Clare (1834–1874), an actress from Charleston, SC. During her New York stage career she frequented a popular beer hall, Pfaff’s Cellar, and earned the title “Queen of Bohemia.” Unidentified by the platform’s legend but clearly seen in the background is a small portrait of poet Alan Ginsberg (1926–1997). Eugene O’Neill (1888–1953)stands holding a Greek tragedy mask, because his plays are bitterly sad and tragic. A founding member of the Provincetown Theater, where his early plays were first performed, Mr. O’Neill drew inspiration for his most famous play, The Iceman Cometh, from a favored watering hole of his, The Golden Swan in the Village. Seated next is Anderson Cooper’s grandaunt, Gertrude Vanderbilt Whitney (1875–1942). Born into privilege Mrs. Whitney traveled a different path than her status would presume. She followed her passion to sculpt, becoming quite good; she fashioned the Washington Heights War Memorial and Peter Stuyvesant Memorial, both in very different New York neighborhoods. She is best known for her lasting legacy, founding the Whitney Museum of American Art, which she first established in the Village at Eight West Eighth Street. In the late 19th century and the first half of the 20th century Greenwich Village was a place where neighbors cared about their neighbors. This mural focuses on the people of who established vital, caring institutions which have proved groundbreaking. The left-hand panel: Dressed in blue Albert Strunsky (1870–1942) stands in the background. Commonly known as “Papa,” Mr. Strunsky was a benevolent landlord from 1923 until his death. South of the Village’s Washington Square Papa leased three tenement buildings—called “Strunky’s Stables by renters—from Columbia University, which owned them. He modernized the interiors and rented rooms to creative folk, sometimes allowing struggling writers and artists to live rent-free for years. The Strunsky family lived at 47 Washington Square. His daughter Lenore married Ira Gershwin in 1926. His face at the front of the locomotive Charles Loring Brace (1826–1890) was a Protestant minister. In 1853 he founded the Children’s Aid Society (CAS) to care for the needs of New York City’s neglected and abandoned children. By the late 1870s, CAS was so well funded, that it constructed residences and schools to tend to the needs its NYC’s poorest. Calvert Vaux, co-designer of Central Park and a friend of Brace, designed a dozen buildings for the CAS throughout New York City four of which are still in use in the Village. The railroad train running through two panels of this mural reminds us of a program of CAS. The program used the burgeoning rail system to transport NYC’s most vulnerable from the slums of the city to the pasturelands of the countryside. Gay men had been flocking to Greenwich Village, to play and to live, for decades. When the AIDS crisis began to take the lives of gay men in the Big Apple in the early 1980s, gay men organized their own support and care system, creating the Gay Men’s Health Crisis (GMHC). Paul Popham (1941–1987), a decorated Vietnam veteran, was a founder and the first president of GMHC from 1981 to 1985. Mr. Popham remained active in the organization until his illness, diagnosed in February 1985, became too severe, and ultimately claimed his life. 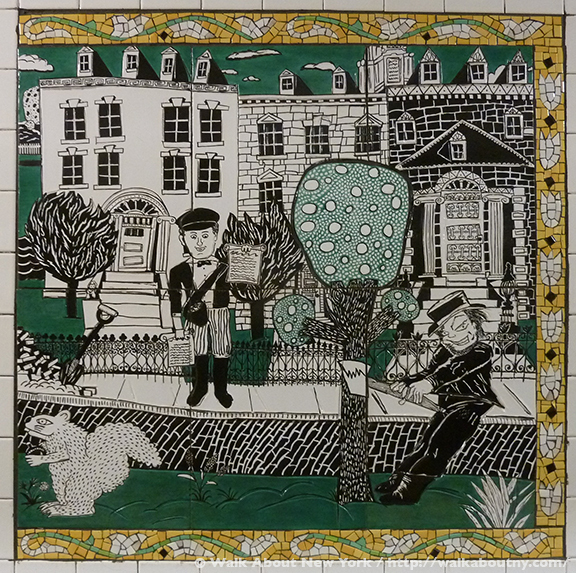 The center panel:The main figure is Mary Kingsbury Simkhovitch (1867–1951), founder of Greenwich House in 1902. Begun to help improve the lives of the neighborhood’s expanding immigrant populations, Greenwich House continues to serve seniors, families and children. The organization’s services include arts education, after-school programs, substance abuse programs, and social and health programs. The background figures illustrate the organization’s mission, which is similar to that of the Children’s Aid Society. 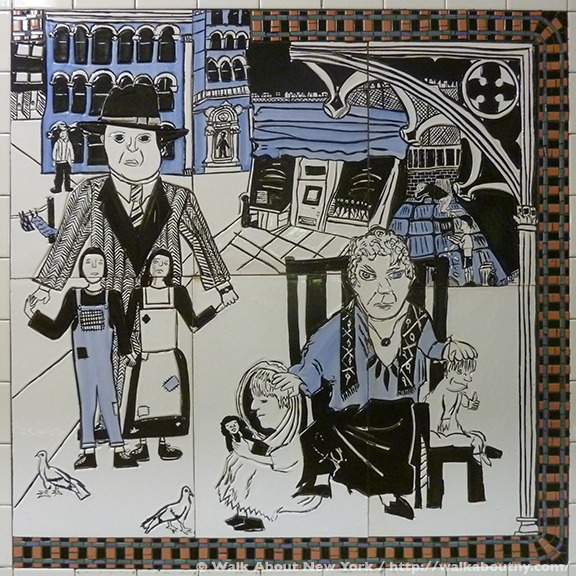 The right-hand panel: Born to immigrant parents, Fiorello LaGuardia (1882–1947)is shown on the left protecting two figures representing immigrants, whom he would translate for at Ellis Island because he was multilingual. A diminutive man, standing only 5’ 2” tall, Fiorello (Italian for ‘little flower’) LaGuardia championed political reform, immigrant rights, and progressive causes. He served the people of New York City, first as a member of the House of Representatives in Congress, then as mayor for three terms during the Great Depression and World War II. Showing educator Lucy Sprague Mitchell (1878–1967) seated with two children is appropriate. She and her colleagues founded the Bureau of Education Experiments (BEE) in 1916. They believed it was essential to create a new kind of educational system to build a more humane world. In 1930 BEE moved to the Village’s Bank Street; and in 1950 it would change its name to the Bank Street College of Education. 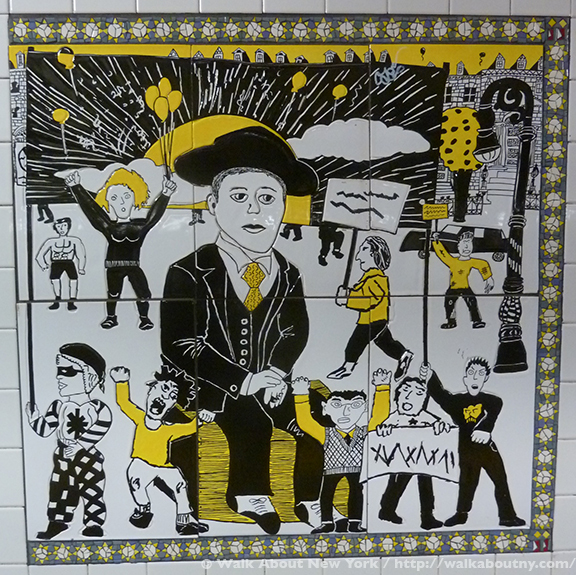 Reaching back to the 17th century and into the 19th century, The Founders mural brings us residents of Greenwich Village who helped establish, shape and give this part of the Isle of Manhattan its unique character and charm. 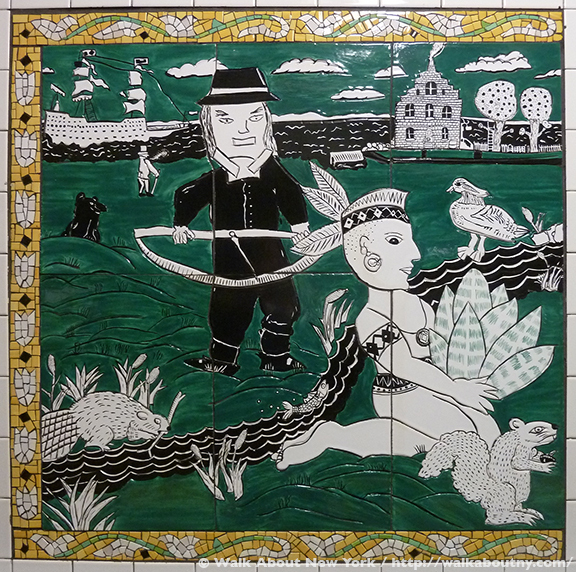 The left-hand panel: The area that would become Greenwich Village was known as Sappokanican to the Lenape tribe, who lived throughout what they called Mannahatta prior to the arrival of Europeans; the area was used for cultivating tobacco. Holding tobacco leaves is Lenape tribe member. Manhattan was wilderness; the land in the Village area was marshy and fertile, filled with plants and animals and a small stream, Minetta Brook, before it was forced underground. Soon after the Dutch settled New Amsterdam the land north of it was soon filled with farm plots. Wouter van Twiller (1580–1654), Director-General of the Neuw Netherland from 1633 to 1638, founded a large and prosperous tobacco farm. Herr van Twiller’s farm, which he named “Bossen Bouwerie,” or “Farm in the Woods,” became Greenwich Village; his farmhouse stood near today’s Washington Square. Herr van Twiller became wealthy through farming and selling land to other farmers. The center panel: A portion of the Washington Arch is seen with two niches. In the left-hand niche is novelist and Greenwich Village native, Henry James (1843–1916). Mr. James bemoaned the Arch; “the lamentable little Arch of Triumph which bestrides these beginnings of Washington Square–lamentable because of its poor and lonely and unsupported and unaffiliated state.” His grandmother lived at 18 Washington Square; this was the setting for his 1881 novel, Washington Square. Standing in the right-hand niche is the painter and stained-glass artist John La Farge (1835–1910). Along with other prominent artists of the late 19th century, Mr. La Farge worked at the 1857 Tenth Street Studio Building, which has been credited with transforming Greenwich Village into a center for the visual arts. Standing at No. 15 (today’s No. 51) it was the first purpose-built artists’ quarters in America. Mr. La Farge contributed stained glass windows and the monumental painting above the altar at the Church of the Ascension, Fifth Avenue and West 10th Street. In the center is Ira Aldridge (1807–1867), an actor who gained international acclaim as an interpreter of Shakespeare in the first half of the nineteenth century. He came to prominence at the African Grove, a theater company of African-Americans at the intersection of the Village’s Mercer and Bleecker Streets. Founded in the early 1820s by the Afro-Caribbean playwright William Alexander Brown, the theater would last three years before being run out of business by harassment from a competing white theater. Born in New York City Mr. Aldridge attended the Free African School and Shakespeare productions at the African Grove Theater. Mr. Aldridge went on to play the role of Othello at the Royal Theatre in London. He toured Europe as an actor, and was awarded Prussia’s Gold Medal in Arts and Sciences, Russia’s Golden Cross of Leopold, Switzerland’s Maltese Cross, and a memorial plaque at Stratford-upon-Avon’s Royal Shakespeare Theater. The left-hand panel: Standing on a sidewalk, holding a newspaper, is Jamaican-born John Brown Russwurm (1799–1851), abolitionist, newspaper publisher, and colonizer of Liberia, where he moved to from NYC. Along with Samuel Cornish Mr. Russwurm founded the abolitionist newspaper, Freedom’s Journal, the first paper owned and operated by African Americans. Published from March 1897 to March 1829 from its first offices at the Village’s Varick Street, the paper reached Haiti and England. The paper’s masthead proclaimed its mission, “Devoted to the Improvement of the Coloured Population.” Gleefully chopping down a tree is Gouverneur Morris (1752–1816), one of three commissioners appointed by a New York State legislative act of 1807. With a deadline of 1811 to complete a street plan they were empowered to layout NYC’s geographic future. To reduce disruption, it was decided to leave Greenwich Village untouched. When some landowners disrupted the surveyor’s work, the legislature passed another law that authorized the surveyor to go onto private property and chop down trees to complete his work. 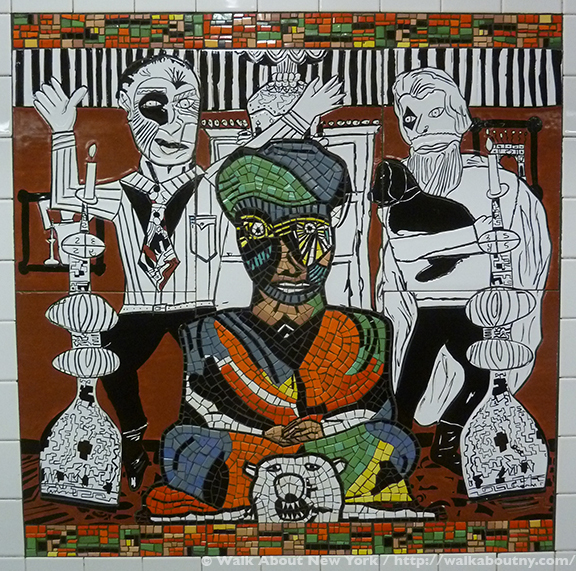 Read other articles about subway art. 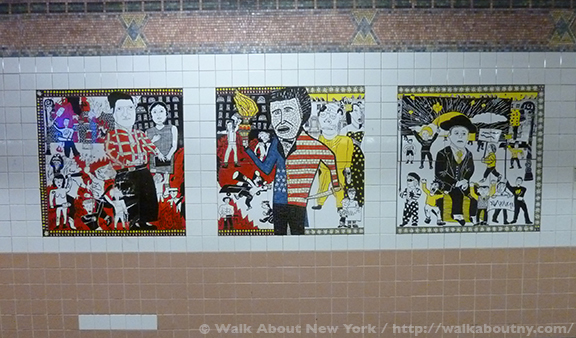 The Greenwich Village Murals are only one example of the grand public art on our Subway Art Tour Four. Take the Tour; Know More!